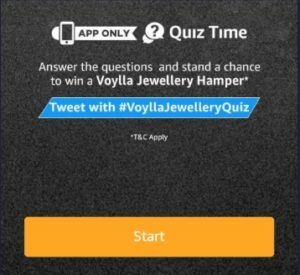 Amazon Voylla Jewellery Quiz Answers & Win Rs 6000. 1 How to win Rs 6000 from Amazon Voylla Jewellery Quiz? 2.1 Ques 1) A bangle typically is worn around which part of the body? 2.3 Ques 2) Which of these is not a kind of jewellery? 2.5 Ques 3) Which of these units is used to measure mass of Diamonds? 2.7 Ques 4) Valentine’s Day is celebrated in honor of whom? 2.9 Ques 5) Which of these famous fictional pairs are lovers? This time Amazon is back with Amazon Voylla Fashion Jewellery Quiz and we added Amazon Voylla Jewellery Quiz Answers. A total of 15 winners will get Rs 6000 prize, we also added Amazon Quiz Winners List. Check all the details in the post. So, just answer 5 Amazon Voylla Quiz questions and get a chance to win Rs 6000. This Quiz at the last of the Homepage in the Amazon App. You will see the above shown image of Amazon Voylla Quiz. How to win Rs 6000 from Amazon Voylla Jewellery Quiz? 2. 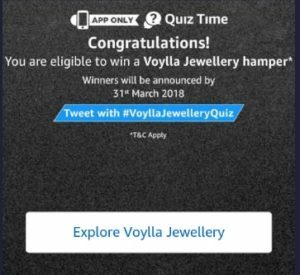 Open the app and you will see a banner about the Voylla Jewellery Quiz Time contest. Click on it. 3. Now click on the ‘Start’ button to begin the Amazon Voylla Jewellery quiz. Ques 1) A bangle typically is worn around which part of the body? Ques 2) Which of these is not a kind of jewellery? Ques 3) Which of these units is used to measure mass of Diamonds? Ques 4) Valentine’s Day is celebrated in honor of whom? Ques 5) Which of these famous fictional pairs are lovers? 5. After answering all 5 questions correctly. That’s it. Just wait for the Winners list of Voylla Jewellery Quiz. This Contest will commence on 13th February from 12:00:01 a.m. (IST) to 10th March 11:59:00 p.m. The declared winner(s) will be eligible for winning Rs 6000 worth Voylla jewellery hamper each.